The final contract will be signed only after a clearance from Cabinet Committee on Security (CCS). In what may be seen as a positive signal towards concluding the multi-billion Medium Multi Role Combat Aircraft (MMRCA) contract for 126 French Rafale fighter aircraft, the Indian and French defence ministers Monday agreed to put the issue on the “fast track”. 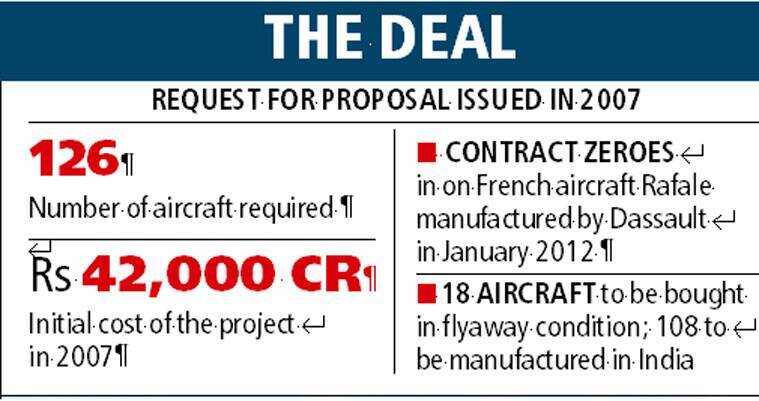 While the over two-year delay in signing the MMRCA deal — in which French Rafale jet was declared the lowest bidder in 2012 — has triggered speculation that the contract may be shelved, Defence Minister Manohar Parrikar and visiting French Defence Minister Yves Le Drian on Monday held a “positive meeting” on the issue. “The two delegations met and talks were held in a cordial manner. Bot the sides agreed to take forward the partnership between the two countries that was envisaged in 1998. All the issues related to defence cooperation were discussed,” an official source in the Defence Ministry told The Indian Express. The contract has remained a point of discussion during the recent diplomatic visits, including that of French Foreign Minister Laurent Fabius in June. The visiting minister had at the time expressed confidence over the outcome of the deal. More recently in October, Air Chief Marshal Arup Raha had said that the contract is in the final stage of negotiations with all the agencies involved, including Hindustan Aeronautics Limited (HAL). According to sources, the difference of opinion between India and Dassault on license manufacturing by HAL has been one of the points of contention, leading to the delay in signing the contract. Raha had however expressed hope that the first squadron of Rafale jets would be ready within three to four years. It may be noted that the IAF is already down to almost 34 squadrons from the stipulated strength of 39.5 and is thus in desperate need of the MMRCA jets.